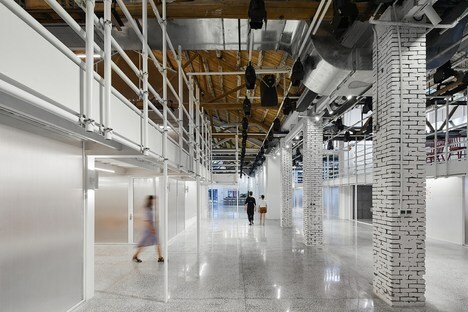 The Chinese architecture firm, X&Collective Design has designed a space for a fashion brand in Shanghai. Just the title itself - Unfinished Space - gets across how flexible the area is, converted from a disused factory warehouse in the middle of an industrial district. The client, UOOYA, asked the team from X&Collective Design to craft a multifunctional, iconic space that would be the best reflection of the ideas behind this Chinese women's fashion brand. All starting from an old industrial warehouse. The architects retained the original structure of the warehouse, merely making some simple changes to the original ceilings. They inserted skylights into the roof which enabled them to create a second floor inside the building where the offices and staff breakout area are located. Here they can enjoy the sunshine and views of the sky. Of course, there is no lack of visual connections between this upper level and the ground floor housing the front desk, conference area and the possibility to hold fashion runway shows. The two floors connect through openings and the large staircase. The use of plants inside the structure characterise informal gathering places, on the one hand, and are the design response to chaotic, and almost uninviting urban backdrop. So, the plants in the space connect the levels and mediate between interior and exterior to provide a sense of wellbeing. To bring in as much light as possible without sacrificing the noise insulation required to ensure optimum working conditions in the various areas, X&Collective Design opted to use polycarbonate panels as dividing walls. The scaffolding throughout the office area is an important part of the spatial composition. Scaffolding is the consummate symbol of building sites, a key part used to set up a secure place for construction workers. Here it has a different purpose and is an integral part of the project by X&Collective Design. Here it has to convey that unfinished feeling that, in the words of the designers “…helps remind people to stay simple and humble, focused and determined, yet open and curious”. Just what you need in a creative environment.